The Etape Cymru is billed as the UK’s toughest closed road sportive – a point immediately hammered home by the 7am start time. With 92 miles to ride over the mountains of northeast Wales, it was certainly going to be a hard day out on the bike. Maybe the organisers wanted to send us off early to make sure we all got back before dark. There was certainly no hanging about. With military precision, around a thousand riders were dispatched in waves of 100, all in the space of about 20 minutes. Considering the numbers, it was a very smooth and slick operation. That’s the benefit of closed roads: no cars to worry about, so no need for gaps between the waves of cyclists. It may have been early morning, but the temperature was already comfortably warm, so shorts and lightweight jerseys were the order of the day. Add the motorcycle outriders, applauding spectators, and the thrill of using the entire width of the road, and the first few miles were reminiscent of this event’s namesake, the Etape du Tour. So far, it was easy, and we were enjoying ourselves immensely. But then reality set in. This was Wales, after all, famous for its mountains, and we reached the first of the ride’s many ascents: Twining Hill. It wasn’t very steep, but it was steep enough to split up the groups, and put an end to any idle banter. Down the other side, a sharp right turn took us onto a picturesque lane winding through spectacular scenery – made all the more impressive by the perfect weather. As we skirted the mountains to the east of Llangollen, the rugged landscape meant constant ups and downs, but the vistas really opened out, and many riders slowed down just to take in the view. Or maybe have a sneaky rest after the climbing. With about 20 miles done, we reached the first major landmark of the ride: the Horseshoe Pass. The main road snaked up the mountainside, with a few hairpin bends and more crowds of spectators – some even ringing cowbells – to lend an Alpine air. Despite the 20 per cent warning signs, most of the gradient was pretty reasonable, meaning we could sit in the saddle, keep the pedals turning nicely, and just enjoy the atmosphere. In contrast, some other riders pounded up the Pass for all they were worth, because the 6.1km stretch to the summit was a timed section. With a height gain of 317m, the ‘course record’ of 14 minutes 22 seconds is held by a certain local lad called Geraint Thomas MBE. On the day of the sportive, the times set by mere mortals ranged from around 16 minutes to well over half an hour. Once across the summit, a few miles of easy downhill led to the second feed station near Llandegla. Wonderfully positioned in the middle of a roundabout (yet another advantage of the closed roads), the tables were well stocked with energy gels, fruit and biscuits, plus a few more unexpected items such as potatoes and jelly babies. After a quick top-up, it was back on the trail again, first with steady stretch down a main road, followed by another section along narrow lanes around the edge of a mountain. All the streams running off the mountain meant lots of little valleys, and that meant lots of little hills to test the legs, and lots of bends to test the bike-handling skills. With about half the distance covered, this sportive was turning out to be no walk in the park, but we were loving it. As the route took us up towards Ruthin, and our legs began to tire, another benefit of the closed roads became apparent. With marshals to hold back cars, we could just keep riding. Not having to stop and then pull away again at every junction seemed to help everyone keep up a decent rhythm. And with recent Grand Tours and Olympic Road Races fresh in the memory, for a few short hours we got a taste of Pro conditions. But the other side of the coin for professional riders is, of course, going up big hills. So fantasies about emulating the stars were severely shattered when we reached the day’s steepest climb, a two-mile struggle up the precipitous side of Esclusham Mountain on a single-track road with the appropriate name of World’s End. The road ramped straight up, forcing some riders to walk, while others weaved from side to side. And even when the gradient eased, things didn’t get any easier as we battled our way through tree-less moorland into a stiff headwind. It was a relief to cross the summit and start freewheeling downhill again, but perhaps some riders relaxed too much, and there were a few crashes on the next section, thanks to a tricky descent with sharp bends and poor road surface. At one point, the road crossed a ford made treacherous by algae, where safety marshals wisely advised us to walk. If we needed more confirmation, lying at the side of the road was an unfortunate guy being treated by paramedics after coming a cropper when attempting to ride across. The last few miles retraced the outward route with what seemed like an endless succession of those little ups and downs, sapping every ounce of remaining energy. At the final feed station, where we might expect keen riders to grab a gel and keep going, there were lots of people taking a proper rest, sitting down on the grass to get some strength back in their legs. But the end was in sight, and reinvigorated by signs that promised 10km to go, then 5km to go, we managed to keep on rolling. Having a few back wheels to follow helped as well. There was one last hill to contend with, then thankfully an easy descent down to the finish, where we were greeted by friendly ride officials handing out medals. Yes, we know everyone gets medals, but after several hours in the saddle, and some killer climbs, we definitely felt we’d earned them. Etape Cymru – The UK’s toughest closed-road sportive? The Etape Cymru is billed as the UK’s toughest closed-road sportive. At first glance, it’s a bold claim, but then you remember there are only a handful of sportives in the country that are totally traffic-free. So being the ‘toughest’ out of this small number is a less impressive boast. But as a closed-road event, the Etape Cymru definitely had some distinct features that made it unlike many other UK sportives. Most significantly, a large proportion of the route was on minor roads, presumably because they’re easier to close to car traffic than the major highways. In this part of Wales, this meant narrow lanes – just wide enough for a tractor – often meandering their way around the sides of mountains and crossing numerous little valleys. This in turn meant constant climbs and descents, as well as numerous sharp bends. Add to that some pretty bad road surfaces, with potholes and patches of gravel, and the need for concentration was paramount. 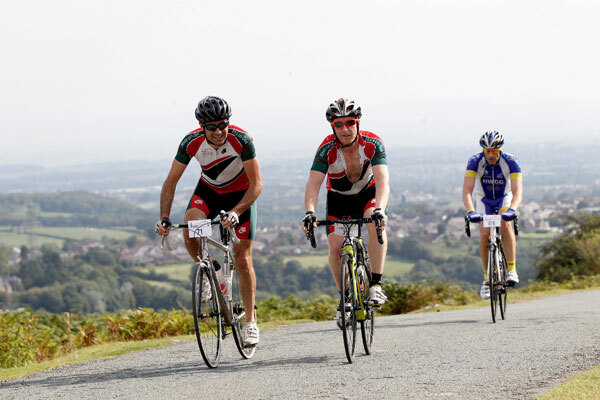 To enjoy the Etape Cymru you needed to be physically fit, mentally alert and know how to handle your bike. Put these aspects together, and that’s what made this sportive a genuine challenge, and it fully deserves its ‘tough’ billing. Make no bones about it, last year’s Etape Cymru did not go well. Food stops ran dry, promised freebies didn’t materialise, and – most importantly – the much publicised closed roads turned out to be not fully closed. Move on a year, and the event has a new owner, a company called Human Race Ltd, with a new team of organisers determined to put on a great show this time around. 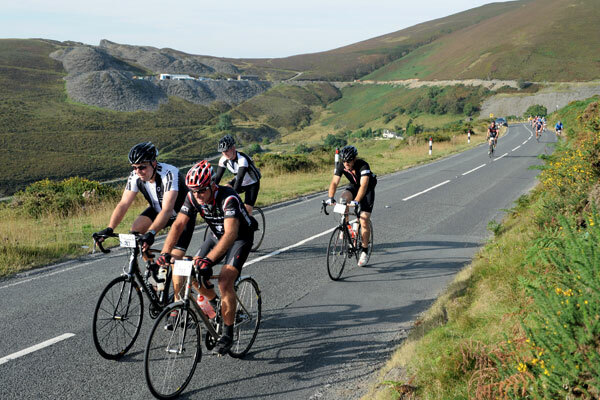 Most riders we spoke to agreed that the 2012 edition of the Etape Cymru was a great success. Highlights included a perfect start/finish venue with plenty of parking, a challenging and scenic course with every junction clearly signed and expertly marshalled, and well-stocked feed stations at about 15 mile intervals, all with helpful staff. There were a few grumbles as well. Some riders were surprised to find a few errant cars on the course (although this possibility had been mentioned in the riders info pack), while others complained about the requirement to collect number and timing chip the day before the ride. “I felt press-ganged into coming away for the weekend” said one participant, while another admitted that although the organisers did allow on-the-spot number collection, it seemed to be given “rather grudgingly”.